Having an active social media presence is vital to building your brand identity (TenFold). Social media is the ultimate platform to connect directly with your customers. One of the most important ways to connect is by responding to social comments. First, you need to establish the tone of your brand. If you are selling glitter makeup your tone is going to be very different than if you are providing life-saving medical services. You need to determine if your tone will be playful, serious, or even sarcastic. No matter what the tone of your brand, you will always need to be friendly, helpful, and informative. Quick response is the key. If someone called your customer service line, you wouldn’t put them on hold for two days before answering their question. Many people now turn to social media for a quick answer. People generally expect a response within six hours from Facebook comments and within one hour from Twitter comments (Hyken). Responding in a timely manner meets these needs and builds your customer service reputation. The value of training your employees cannot be emphasized enough. One small employee slip can damage your entire company’s reputation. Any employee tasked with social responses needs comprehensive and routine training. 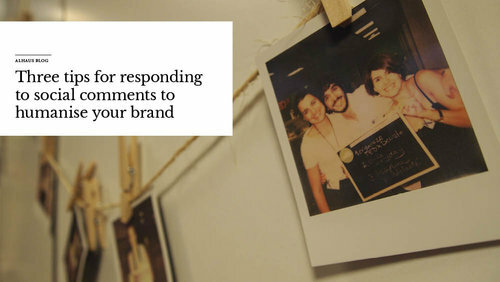 Strategically responding to social comments does not just build your customer service credentials. It also can help you get great ideas for content. If you find that your customers are asking the same questions over and over again, you can turn that question into a blog post, add it to your FAQs, or even make an infographic or a video. ALHAUS can help you take social comments and turn them into informative content. Contact us today to learn how!